Keemo Paul was the pick of the Jaguars bowlers with 6-57 in the Volcanoes first innings. 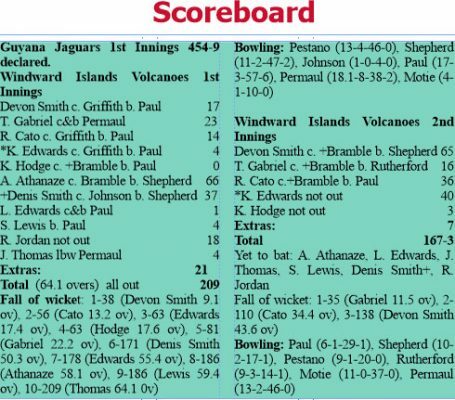 The Windward Islands Volcanoes, forced to follow-on, were 167-3 in their second innings at the close of the third day’s play of their fourth-round Cricket West Indies (CWI) Regional four-day match against the Guyana Jaguars at the Providence National Stadium yesterday. 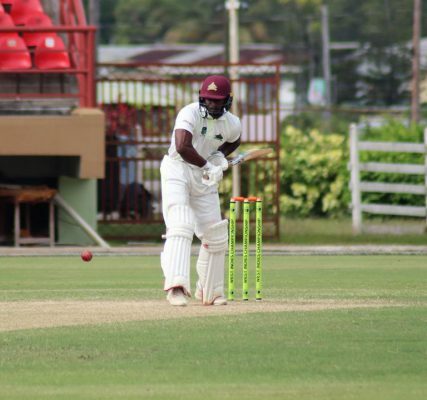 Replying to the Guyana Jaguars first innings score of 454-9 declared, the Windward Islands Volcanoes, resuming yesterday on 99-5, were dismissed for 209 in their first innings with Guyana Jaguars Keemo Paul bagging a six-wicket haul. Batting a second time the Volcanoes fared much better, with former West Indies opener Devon Smith leading the charge with a half century. Kirk Edwards faces up to Veerasammy Permaul. The Volcanoes are currently trailing by 78 runs after closing day three on 167-3 from 58 overs. In the Volcanoes first innings, Twenty-year-old Alick Athanaze and wicket-keeper Dennis Smith scored 66 and 37 respectively. The pair struck five boundaries in the first five overs, favouring the backward point and gully areas. Left-arm spinner, Veerasammy Permaul could count himself unlucky as on two occasions, the batsmen missed chopping the ball onto their stumps. 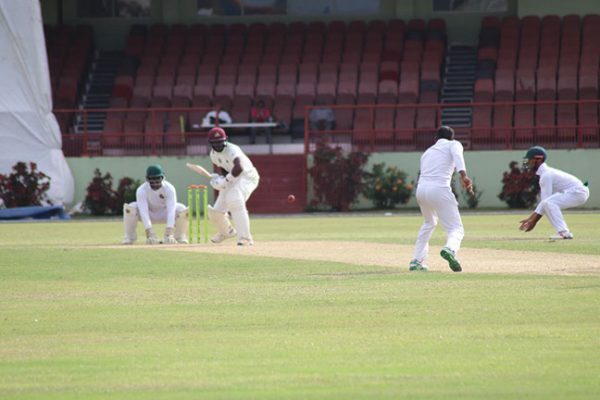 Athanaze was also dropped on 34 by wicketkeeper Anthony Bramble, the ball dying on him as he dived to his right. Athanaze pushed on to bring up his second first class half century. Devon Smith made a battling 66 in the second innings. His 66 came from 114 balls and included 11 fours and one six. Earlier, the Dominican partnered with Smith to put on 90 before Smith feathered a catch to Leon Johnson at first slip off of Shepherd. His innings of 37 came from 93 balls. Ray Jordan, who struck four boundaries, was unbeaten on 18 from 19 balls. The opening session belonged to Paul who bamboozled Larry Edwards, first peppering him with a short, lifting ball, followed by a fuller delivery that saw the batsman popping a return catch back to Paul, giving him his third five-wicket haul at the first-class level. Paul getting the ball to move into and away from the batsmen, had Shermon Lewis playing all around a delivery that picked the top of middle stump. He ended with 6-57. Permaul took the final wicket of Josh Thomas to finish off the Volcanoes and signal lunch while the defending champions duly enforced the follow on upon resumption. The session was subdued as Volcanoes lost Gabriel who nicked Sherfane Rutherford to Bramble for 14 as they progressed to 62-1 at tea. 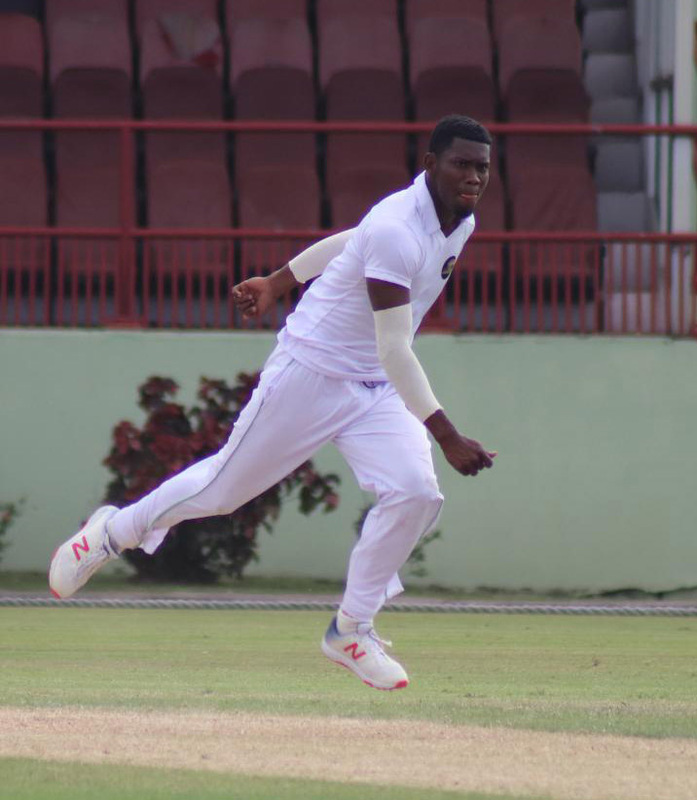 Smith and Roland Cato added 75 for the second wicket before Cato was caught behind off Paul for 36 after facing some 65 balls and striking five boundaries. Smith was subsequently given out caught behind to Shepherd for 65. Smith pounded eight fours in his 128-ball stay at the crease. Kirk Edwards, unbeaten on 40 from 76 balls, and Kavem Hodge, not out on three were together at the close.